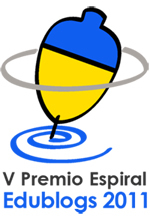 IES Xesús Taboada Chivite (Verín - Spain) has just embarked on a Comenius project (the three schools that are going to participate in this project are located in Lyngby(Denmark), Portogruaro (Italy) and Verín (Spain)). Next 20th November our 1st year Baccalaureate students are going to travel to Portogruaro. The topic all the schools are going to work on is "Water". Belén, Javier and Lorena are three first year Baccalaureate students who have been selected to take part in this Comenius project and they have designed a ppt entitled "The Problem of Water", which you will see in this blog very soon. As you know if you are regular followers of this blog (click HERE) , Xesús Taboada Chivite School also takes part in the European Language Portfolio Project. This year one of my groups, 1st ESO (Compulsory Secondary Education) D is going to carry out several activities which the students are going to include in their Portfolio. The first activity is connected with the topic the "Comenius students" are working on ("Water"), since we intend to spread the "Comenius Spirit" all over our school. My first year ESO students are going to learn about the water cycle. I’ll provide an explanation in English using the pictures above and once they have understood what the water cycle consists of, they will learn the rap "The Water Cycle" (above)by heart and sing it. We will record ourselves singing "The Water Cycle". VERY SOON in this blog!!!!!!! !